Many features of Angela Nuran Shoes can be done in the salon or at home by the consumer. Refer to our frequently asked questions and demo videos below. If you don’t see what you need, feel free to contact us for help. Keep in mind all our versatile options can be ordered after the shoes and clutches have been bought, or even after they’ve been worn. The original shoes can be given a whole new look. Keep extra straps and brooches on hand to transform your shoes to match different outfits. How do I select the right wedding shoe style? Let the goal of finding a pair of shoes comfortable enough to wear from start to finish drive your decisions. A shoe that does what you need outranks a fantasy shoe that you can’t wear so think this through carefully! Consider wider heels, wedges or flats if the affair is outdoors or on uneven terrain. If you love very high heels, get platforms which reduce the pitch of a stiletto heel thus feel more comfortable. Get shoes with supportive straps if you plan to dance the night away. Gowns are hemmed for shoe height so if you switch to flats later, your gown will become too long and you (and everybody else) will step on it. 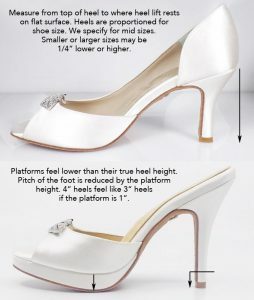 If the balls of your feet burn during your gown fitting, try to get lower heels. If they’ve already done the hem, try to switch to platforms. Though our shoes are more comfy than most other brands, they’re not magic. Have a pair of old faithful back up shoes, just in case. How do I order or buy wedding shoes? The best plan is go visit an Authorized Retailer to see and try on our shoes. If there isn’t a retailer near you, ask your local bridal salon to send us a purchase order for your wedding shoes. You can contact one of our extremely knowledgeable Flagship Retailers to order by phone or online. If you’ve already worked with one of our retailers, we’d appreciate if you give your business to that store. If you had a problem there, we’d appreciate if you let us know about it. Clearance shoes can be ordered directly from our Final Sale section or your retailer can order them for you. Can I wear suede soles outside? Yes, but if you step in water, suede soles absorb moisture. They should be fine when they dry. A soaked suede sole may peel back, but it’s a simple fix by a good cobbler or DIY with a good adhesive. How do I get my wedding shoes or clutch dyed? When you order from a retailer, they’ll send us a color swatch to match and we’ll ship the dyed shoes or clutch to the store. If you don’t need to match color, look at our dye card while at your retailer and they’ll tell us your color choice. If you already have your shoes or clutch, send them to us with our Dye Form specifying a standard Angela Nuran color or include a swatch. If you provide a digital image (risky), we’ll match color as shown on our screens which may be quite different from the true color. What we see is what you’ll get. Don’t do this if accurate color is needed. Normal turnaround time for dyed goods is within 2 weeks but rush orders are accommodated. 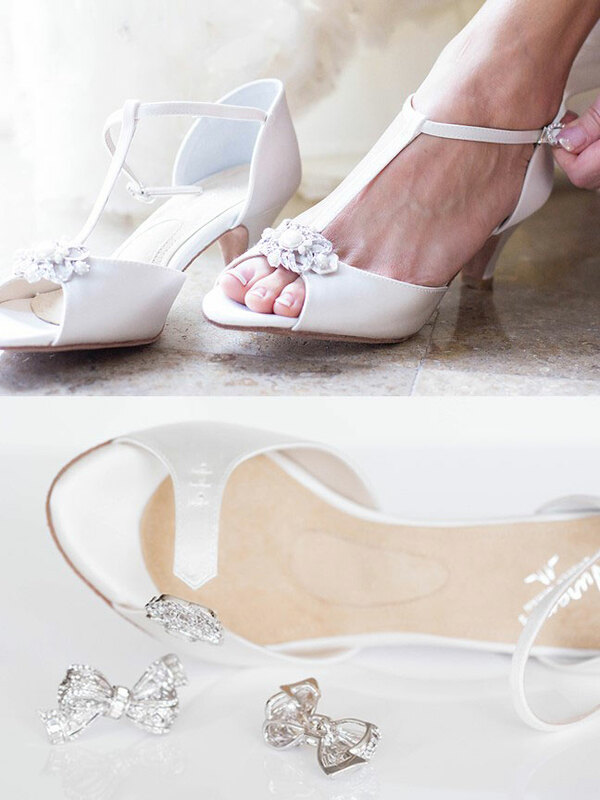 How do I get my wedding shoes glitzed or adorned? Your retailer will specify your custom shoe decor when placing your order. If you already have your shoes, send them to us with our Glitz Form. Contact us if you need a quote for a custom design. How do I order wedding shoe accessories? Your retailer will specify your chosen shoe accessories when placing your order. You can order accessories after you’ve received your shoes by contacting your retailer or our Flagship Retailers. You can order shoe brooches, ankle strap buckles, optional shoe straps and clutches by clicking here. If your shoes will be dyed, order clutches and optional straps in time for everything to be dyed together in the same batch. How do I clean my wedding shoes? Heavily soiled silk shoes rarely can be restored to original condition, but can be transformed into lovely special occasion shoes when the light silk is too stained to clean. Please have reasonable expectations. Download the Dye Form, circle ‘clean worn shoes’ and ship to us. If stains won’t come out, we recommend dyeing them, and black covers pretty much everything except scrapes and rips. 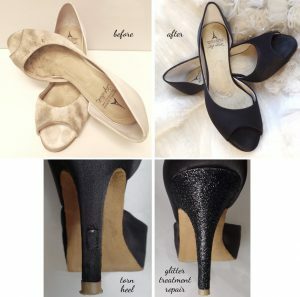 For torn heels, our glitter treatment or glitz tip conceals damage completely. Do NOT use water, soap or detergent. Carefully remove dried dirt or debris from silk, insole and suede outsole. Lay a clean white towel on your work surface. Avoid working on a wood table. After you’ve removed dry debris, put your shoes on the clean towel. Use clean white cotton pads and Q tips dipped in cleaning fluid to coax out stains. Change pads and Q tips frequently as they get dirty. Silk abrades if rubbed so be very gentle and let the cleaning fluid do most of the work. Feather fluid away from the wet area and wave a blow dryer over the shoe to minimize an aura. Repeat process up to 3 times. Further attempts could do more damage than good. How do I measure heels? We measure heels at the highest elevation. 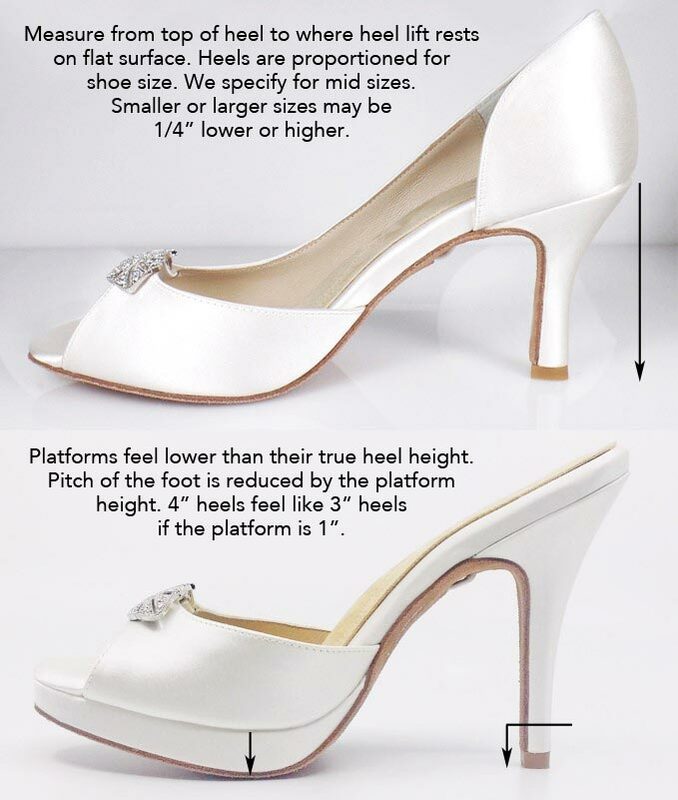 Average heel height for all Angela Nuran styles are on the product details. Have a question not covered here? Drop us a note on our Contact Us page and we’ll get right back to you.